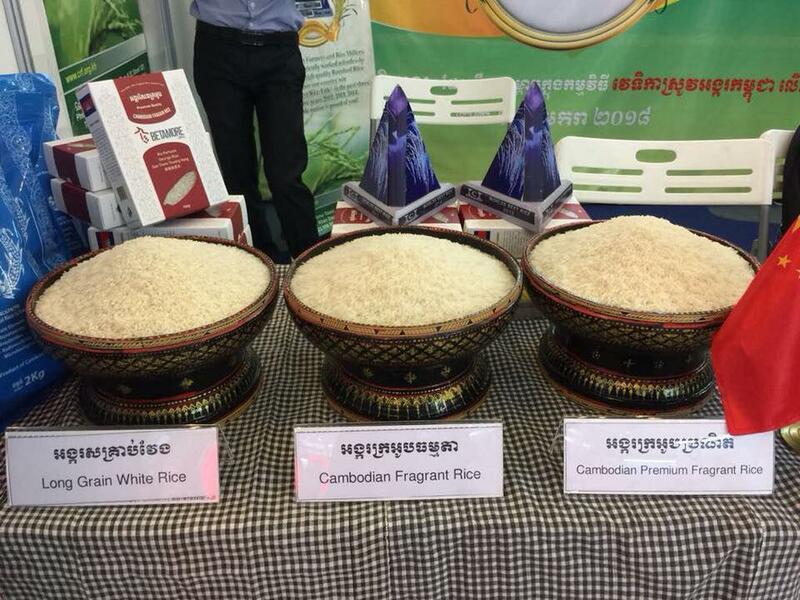 Phnom Penh (FN), April 10 – Cambodia exported 51,550 tons to EU within the first three months of 2019, decreased by 32 per cent compared to 76,760 tons of the same period in 2018, according to Secretariat of One Window Service for Rice Export’s report released on Wednesday. 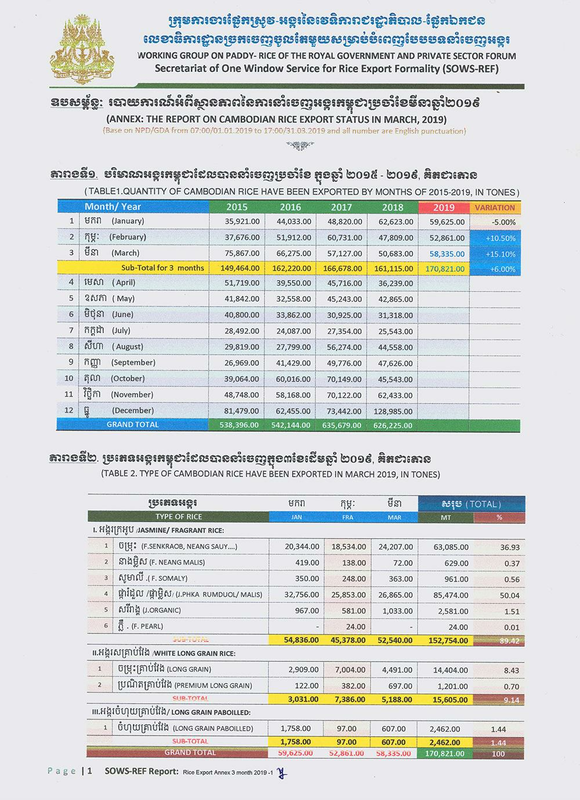 The decrease of Cambodian rice to EU market caused by the EU’s imposed taxes on Cambodia and Myanmar rice, which exports to 28 EU Member States. The taxes, effective from 18 January 2019-2021, will cost Cambodia 175 euros per ton in the first year, 150 euros the second year, and 125 euros the third year. 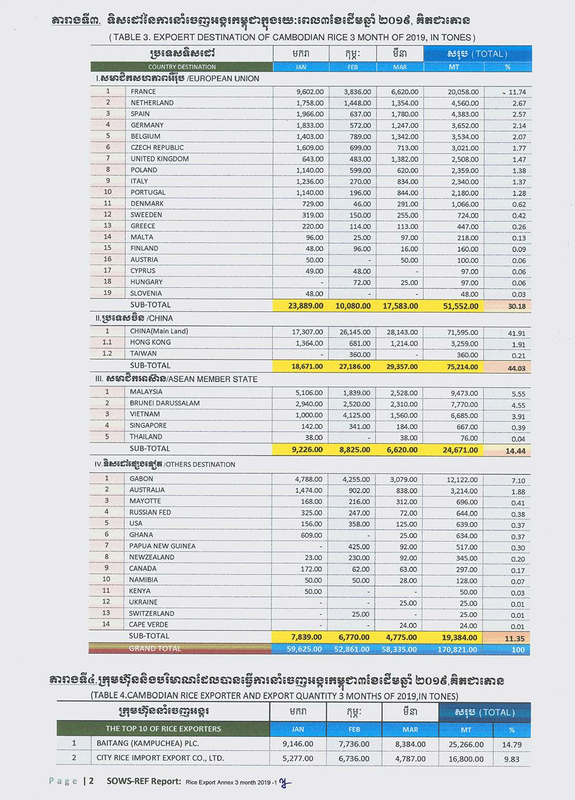 The report indicated that in the whole year of 2018, Cambodia exported nearly 300,000 tons of rice to Europe, an equivalent to 43% of the total export volume, 630,000 tons. Commerce experts claimed that Cambodia is likely to lose $50 million per annum. China and Vietnam together granted a quota of 700,000 tons to Cambodia amid the EU’s tax on rice. 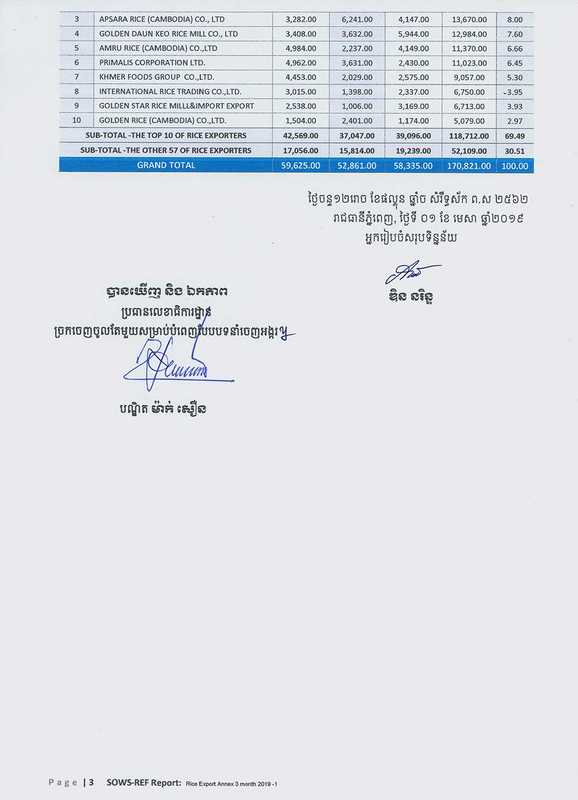 Today’s reports show that Cambodian rice to China within the first three months of 2019 has increased by 81 per cent, a leap from 41,410 tons to 75,215 tons. Food shortages occurred in Cambodian during the 1970s; Today, Cambodia has enough food to feed 16 million people with the surplus of four million tons of rice per annum, exporting to over 60 countries. Rice export has increased from 200,000 in 2012 to 370,000 tons in 2014, and to 626,000 tons in 2018 respectively, making the kingdom one of the major rice exporters in the region. The Royal Government sets to export 1 million tons of rice, yet Head of the Government Hun Sen said we have yet achieved our rice export goal due to the limited rice-processing capacity and high cost of input.